Clothing/Jewelry Description Work clothes and cowboy boots or work boots. Medical Conditions Rogers takes medication for unspecified reasons; his medicine was left behind. He has problems with his feet and can't walk far. Distinguishing Characteristics Caucasian male. Graying brown hair, blue eyes. Rogers may go by his middle name, Clark. He had a mustache at the time of his disappearance. He is missing all but three teeth and he has surgical scars on his chest and back. 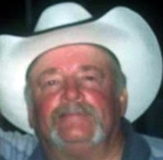 Rogers was last seen in Liberty, Texas on December 30, 2011. He spoke to his brother and his son on the phone at 11:40 p.m., asking if they'd like to go with him to the Veterans of Foreign Wars (VFW) hall. They said no. Rogers was last seen leaving the VFW hall. He has never been heard from again. The next day, Rogers's stepson and his wife saw Rogers's green 1998 Jeep Grand Cherokee on the side of Texas 231 near County Road 2243, between Cleveland and Tarkington Prairie. They didn't think of it at the time, but as days passed and the Jeep remained in the same location, his stepson became concerned and spoke to his mother about it. Rogers's wife went to the Jeep and put a rock under the tire to see if it was moved. She found his cellular phone and medication inside it. His stepdaughter reported him missing on January 6. At the time of his disappearance, Rogers was separated from his wife and they were arguing. Because of issues with his feet stemming from his military service in the Vietnam War, his family doesn't think he could have left on foot. The Jeep was his only method of transportation. It's completely uncharacteristic of him to leave without warning and his case remains unsolved. Updated 1 time since October 12, 2004. Last updated February 27, 2018; casefile added.